Below is a list of Chambers of Commerce and civic organizations based in Town of Oyster Bay that have requested to be listed on the Town’s Web site. 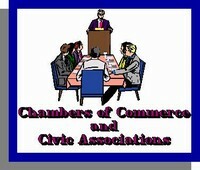 If your Chamber or civic would like to be included, write a letter, on official stationery, listing the name of the civic or Chamber; the president; a mailing address; a contact person, if different from the president, and phone number; and if the organization has a Web site, the Web address. The letter should be addressed to: Supervisor Joseph Saladino, Town Hall North, 54 Audrey Avenue, Oyster Bay, NY 11771.